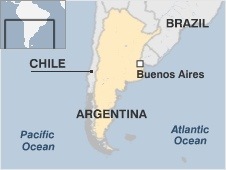 Climate: Argentina stretches 4,000 km from its sub-tropical north to its sub-Antarctic south, i.e. The further north you are, the warmer it is and the further south you are, the colder it is! Its many different landscapes such as jungle, mountains, glaciers and grasslands!